One of our biggest fears is what lies beneath the vinyl siding on our house. I'm always spouting off to my clients about the evils of vinyl siding. And yet.... we have old vinyl siding on our house. Removing the siding has been a big stress for us and an unplanned expense (if we need new siding) that makes it more conducive to just leave the damn stuff on. 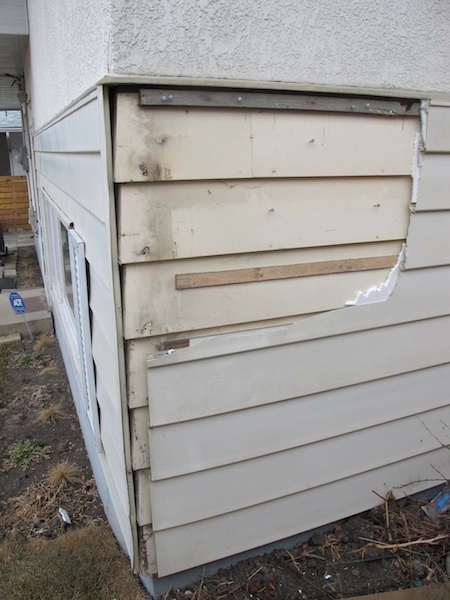 It was fairly mild yesterday, and maybe hubby just felt the need to rip something apart, so he took off a portion of the siding on an inconspicuous side of the house. Cool. Take it off! Expose that hostage original siding! Although, hey, usually you don't actually have to cut the siding off to see what's underneath. You can usually just peel back a layer or two.. Hostage original siding. I might need to steel that phrase. Apparently it's nailed on tightly so clippers were the best option for now. I didn't realize you guys had vinyl siding too! Unfortunately in our case, the vinyl siding covers our entire house and the nails have damaged what's underneath. We had originally hoped to just remove the siding and bring the exterior back to the original style, but I think there are too many holes. Oh, and what is your plan for the shutters? Kathy - the stucco is original. We're not going to touch it. pre 1980's houses used a different type of stucco with more lime. There's also very few old stucco craftsmen left in the city so we're just going to repair in the kind the cracking and paint with a flat colour so it detracts from the cracks. The new stuccos have sealers and plastic crap that I personally think will negatively alter the breathing of the house. If you're going to re-stucco, try to find someone who knows who to use traditional lime-based stuccos and has at least 30 years experience. Any of the new products are expensive and just won't last on your house. Thanks so much for the info, Laura. I really appreciate it. Looking forward to watching the rest of your exterior renovation unfold. It's gonna looks great!